We experienced a rare case of idiopathic hemihypertrophy with hemihypertrichosis and would like to share our case. A 4-year-old boy visited our clinic with asymmetric legs. His left leg grew faster than his right leg, and hair density and thickness of left leg had increased more than that of the right leg since the age of 10 months. No past medical or family history was noted. On gross inspection, the left leg was thicker than right leg [Figure 1]a, and circumference of left calf was 2 cm longer than that of right calf (determined using a tape measure). 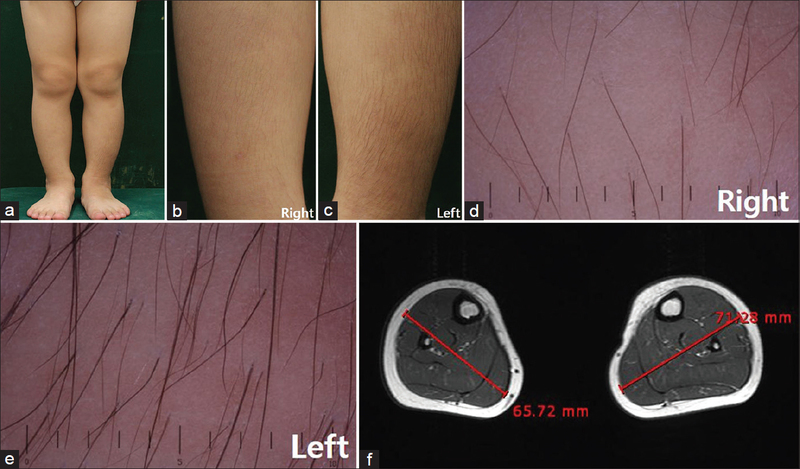 Along with asymmetric size of legs, the density of hairs on left shin was greater than that on right shin [Figure 1]b and [Figure 1]c. Folliculoscopic imaging showed that the number and thickness of hairs on the left shin were increased compared to those of right shin [Figure 1]d and [Figure 1]e. Magnetic resonance imaging of the lower legs was conducted for further evaluation and revealed relatively hypertrophic muscles in left calf. The maximal diameter of calf, as measured on the image was longer in left calf than right calf [Figure 1]f. Other structural abnormalities, such as body abnormalities and lipoatrophy, were not detected. Laboratory tests did not reveal any other systemic abnormalities. Finally, the patient was diagnosed with idiopathic hemihypertrophy with hemihypertrichosis, and no further abnormalities occurred during 4-year follow-up. Hemihypertrophy is a congenital abnormality of cell proliferation leading to asymmetric overgrowth or a region on one side of the body. Hemihypertrophy can occur as an isolated abnormality or as a component of overgrowth syndromes such as Beckwith–Wiedemann syndrome, Proteus syndrome, Silver– Russell syndrome More Details, Klippel–Trenaunay– Weber syndrome More Details, Bannayan–Riley syndrome, encephalocraniocutaneous lipomatosis, hemihyperplasia syndrome, etc. Hypertrichosis is a condition that causes excessive hair growth. It can develop across the entire body surface or over a limited area. The cause of hypertrichosis is unclear. Congenital hypertrichosis is considered to be a genetic disorder that is inherited or occurs as a result of spontaneous mutation. Three forms of congenital hypertrichosis have been reported. Congenital hypertrichosis lanuginose causes excessive growth of long and nonpigmented hairs all over the body. Congenital hypertrichosis terminalis is similar to congenital hypertrichosis lanuginose but causes fully pigmented terminal hair growth over the entire body. It is usually associated with gingival hyperplasia or teeth abnormalities. Nevoid hypertrichosis is localized hypertrichosis that causes terminal hair overgrowth over a limited area. It is not usually accompanied by other abnormalities, but often accompanies spina bifida. Our patient had hemihypertrophy on the left leg and localized hypertrichosis clinically similar to nevoid hypertrichosis. However, there were no other abnormal findings on physical examination, imaging studies, or laboratory studies. Finally, he was diagnosed with idiopathic hemihypertrophy and hemihypertrichosis. To the best of our knowledge, four cases of hemihypertrophy and hemihypertrichosis without any other abnormalities have been reported [Table 1]. Other syndromes accompanying hemihypertrophy are usually caused by genetic or epigenetic mutation of specific chromosomes, however, etiology of hemihypertrophy with hemihypertrichosis remains unclear. Further evaluations are required to determine whether these two conditions are purely incidentally coexistent or represent a new kind of syndrome. Mohanna MA, Sallam AK. Idiopathic Hemihypertrophy. Saudi Med J 2014;35:403-5. Nyati A, Kalwaniya S, Agarwal P. Idiopathic Hemihypertrophy with multiple fibroadenoma. Indian Dermatol Online J 2016;7:316-7. Wendelin DS, Pope DN, Mallory SB. Hypertrichosis. J Am Acad Dermatol 2003;48:161-79. Wallach D, Jayle D, Vignon-Pennamen MD, Benichou JJ, Papas E, Labrune B. Congenital corporal hemihypertrophy with hypertrichosis. Ann Dermatol Venereol 1985;112:787-8.